TRAINING BEGINS WHEN YOU ARRIVE AT THE DOJO. A dojo, or training hall, is neither a sports venue (having no spectators) nor a school. It is a unique environment where Calm and Focused Awareness are developed through training in martial technique. It is a refuge from the outside world, that should be mentally ‘left behind’ as you enter. Training requires both calm and focus, and a quiet, focused environment is the desired ambience of the dojo. As Aikido has neither competition nor aggression an Aikido dojo is more peaceful than most. Although initially some rules need to be learnt, dojo culture does not come from a set of rules but rather from the understanding of, and respect for, the goal of Aikido and the dedication of its practitioners. Students must arrive early, allowing the class to start on time. Children must wear shoes to the dojo door. No lollies or sugary drinks should be consumed before class by those children who have a tendency to become sugar-hyperactive. Children’s sores should be covered with an effective bandage or plaster. 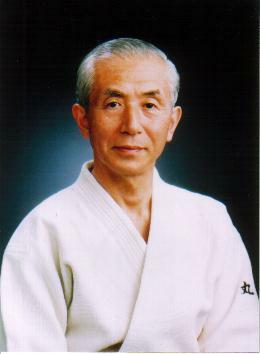 * The Aikikids badge should be sewn on the left chest of the gi. * Your child’s first name may be written or embroidered in black one-centimetre lettering onto a white sew-on patch, and sewn-on high up on the left sleeve of the gi. Make sure it’s colour-fast!! * Tying the gi belt should be practised at home as homework until successfully acquired. * Please remove your shoes before entering the dojo, and place neatly outside. * No hats are to be worn inside the dojo. * If you choose to stay and watch, please be quiet. * Ensure your mobile phones are switched off in the dojo. * No eating or drinking is permitted in the dojo. * Always arrive with plenty of time to change into your gi and sign in. * Wear your shoes from the carpark to the dojo. * Take off your shoes at the dojo door and leave neatly outside. * Bow towards kamiza when you enter through the dojo door. * Go to the changeroom and change quickly. * Go to the desk and check in. * Bow towards kamiza before stepping onto the mat. * Sit quietly and wait for class to start. Wait off the mat for a sensei to signal that you may join the class. Then bow and step onto the mat. * Your gi should be clean. * Boys cannot wear T shirts under gis. Girls can wear a white t-shirt or singlet under their gi. * No rings, watches or jewellery can be worn on the mat in training. * Your body,especially your feet, must be clean before stepping onto the mat. * Your fingers and toenails must be trimmed to avoid scratching your partners. * If you have a sore, make sure it is covered with a bandage or plaster. * Always bow towards kamiza when you enter and leave the dojo. * Always bow towards kamiza before you step on and off the mat. * Always bow towards kamiza when you take a weapon on and off the mat. * Always bow to a training partner when you start and finish practising a technique with them. * Always bow to a sensei to thank him or her for giving you personal instruction. * Always sit in seiza and wait calmly if you are not doing techniques. * Kneel down…on left knee first. * Stand up…with right leg first. * Do not run in the dojo, either on or off the mat. * During class always ask a sensei if you want to leave the mat. * All instructors are called sensei during class. * Treat all senseis with respect at all times. * Do not be lazy in training. Be calm and focused. * Learn by focusing your attention and by practising intelligently. Never interrupt the class by calling out. If you have to ask a question, wait until the sensei’s attention is available. * Always keep the dojo clean. Pick up any rubbish. There are rubbish bins in the change-rooms. The dojo is a special place. It isn’t like school, or home, or a playground or a sports field. It is a place to practice and enjoy CALM IN ACTION, which is Aikido. This requires Focused Awareness which is difficult to learn if its too noisy. Keeping quiet doesn’t mean tiptoeing around like a mouse. It means respecting the calm feeling in the dojo, and playing your part in keeping that feeling of calm. Relax and enjoy it ! The class should never be disturbed by arguing, gossiping, asking unnecessary questions or pushing and shoving. Uke is the one who falls, and Nage is the one who throws. We all take turns as uke and nage. When it is our turn to be uke we must try to flow wherever nage is leading us. This is very important, because it helps nage to learn the feeling of correct technique. Ukes must flow with the techniques, get up quickly, and turn to face nage, fully alert, and ready to attack again. Aiki Discipline is NOT punishment. It is not meant to hurt you, embarass you, insult or reject you in any way. It is done with love and kindness, to help you learn how to calm and focus yourself, so that you can grow into a Warrior of Peace. It is part of your training. Anytime that a sensei feels your calm or focus has been lost, then he or she will simply send you to a Quiet Corner. They won’t give you a warning. It’s then up to you to calm and focus yourself. It is not a sensei’s job to be a schoolteacher or a parent. Your behaviour is not their ‘problem’…it’s yours!! Remember the dojo is not like school or home. In the Quiet Corner you will sit quietly in seiza, facing away from the class, and focus on what the sensei has given you to do. After about five minutes, if you are ready, you will turn around and face the class again sending ki towards the sensei who sent you to the Quiet Corner. You are young and you have great potential to do and be whatever you want. So…be good and do good. is part of the Upliftment of all living things.